The weather in our part of this wide world has been kind of wonky this year. Some people say it has just gone back to normal for our area, but I don't know about that. Last year was abnormal with a drought happening, and the wildfires all around made it pretty scary for a while. Of course, we had a bit of a family reunion at the end of July last year, and the weather didn't exactly co-operate, it was the chilliest time out of the summer. We had a blast just the same, but our daughter, Chera commented that every time they come here it's cold and wet. They like to camp when they come. And she is right - the last few days of their visit was cold and wet, but it didn't stop us from having a blast! Yesterday, I pulled all my pansies out of their planters and started tidying up some of the gardens, getting them ready for fall and winter months. The shasta daisies are next and this morning when I went outside to water in the backyard, the leaves on my beans have begun to turn yellow. 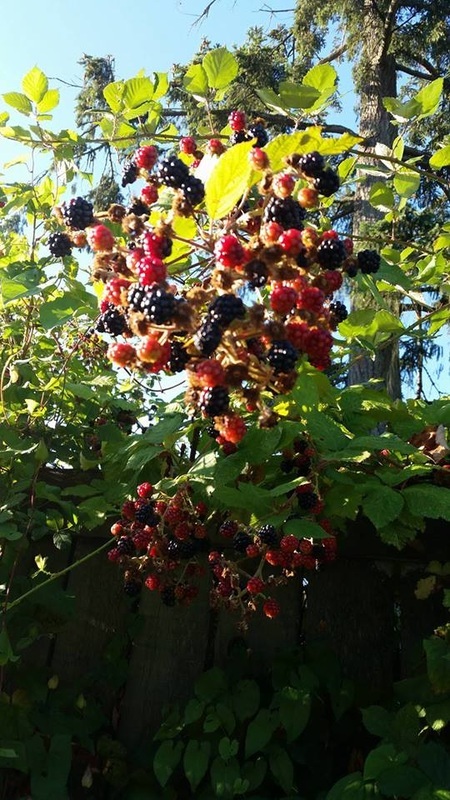 The blackberries that grow wild all over the place are abundant this year....and they are almost a month ahead of their regular schedule. Even the peaches are on sale a couple of weeks earlier than they used to be. I wonder if this is a permanent change in seasons or just a giant blimp on nature's path. The rivers are so low, I worry about the salmon run. Will there be enough water for them to make it to the spawning grounds? I think last year there had been talk about trucking the salmon to where they needed to be. It did rain enough at the last minute to make it easier for the fish, but I wonder about this year. The leaves on the trees are already turning golds and yellows and on our walk yesterday, my sister Janet and I noticed the dry leaves on the trail. It is too early!! It's supposed to be summer!!! The changes have me itching to get out my fall decorations and start making changes in the house! I am starting my fall cleaning lists already! This is NOT supposed to happen until well into September!!! Janet mentioned that her and her hubby are going camping next week and there is no fire ban this year. We actually haven't had all that much rain, but it has been cooler with a lot of misting type rain with a couple of good downpours over the months. Today is sunny and it will be beautiful and hot! It will motivate me to get out and pick blackberries, after I can the other 40 pounds of peaches! It will remind me that it is still summer and the bins of fall decor can stay in the storage room for another few weeks! Stop and smell the flowers wherever you are. Enjoy your day!